A pop-directed song suitable for a TV/film soundtrack that retains Hilary Scott's signature lyrical and melodic approach. Just A Shame, along with three other songs, is a single that has taken an interesting journey from start to completion. 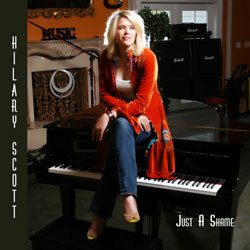 Hilary Scott was hired several years ago to complete a publishing deal in Nashville. She co-wrote several songs with big names in Nashville songwriting (Angela Kaset and John Goodwin) and Matthew Wilder of Wilderside Productions. Amidst a cross-country move, several years of international touring and other delays, the songs remained on a hard-drive until March 2012 when Hilary returned to Nashville to complete them. Several intense days of recording, while residing at a beautiful horse ranch just outside of Nashville, readied the songs for mixing and mastering. Backing musicians include some of Nashville’s finest: Gary Lunn on bass, Jerry Kimbrough on guitars, Lonnie Wilson on drums and Matt Wilder on guitars, keys and drum programming. Those familiar with Hilary Scott’s large catalogue will find Just A Shame a significant departure from her other work. The goal with the writing/publishing sessions was to write pop directed, TV/film sountrack, big radio style tunes. This goal was reached. Just A Shame still retains, however, the signature sounds of Scott’s lyrical and melodic approach, amplified to aurally stunning degree by Wilder’s fantastic production.